Well, I guess this is the international insect issue. Above you see a Nashville monarch butterfly just getting set for its maiden flight and a tiny Mexican honey bee at the entry to her hive in Tulum, Mexico. Lots of things went on this year, most of them interesting, fun, or educational. The others we left out. Who wants to remember them? 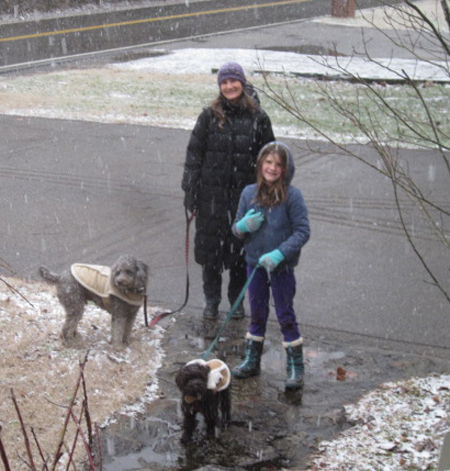 January 12, 2018, daughter Travis and granddaughter Elizabeth take Puppy and Raven for a walk in our brief and soggy snow. It didn't last long. January 12, Ms. Jane Tabby has a better idea. 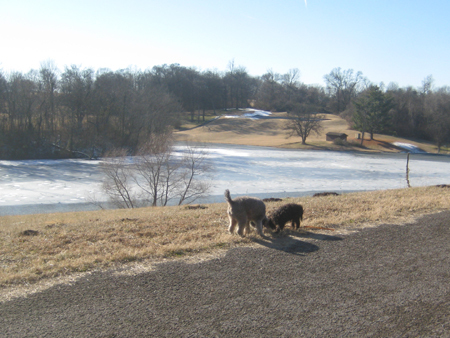 January 19, then, all of a sudden, things dry out and warm up and the dogs get a run over by Two Rivers Park. They find dead things that are of great interest and often want to take the memory home by rolling on them. There is a nonprofit working to build play areas for children and interesting walks for all up there at Two Rivers. This was a new feature since we last visited. 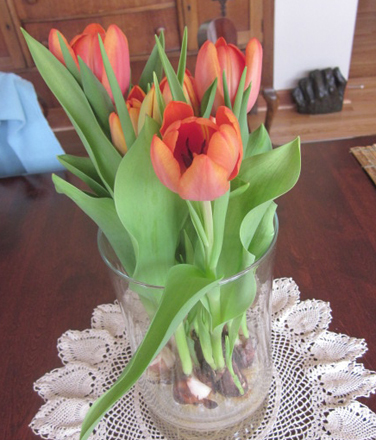 February 1, Sherry loves her flowers and always tries to have some in the house. Aren't these nice? 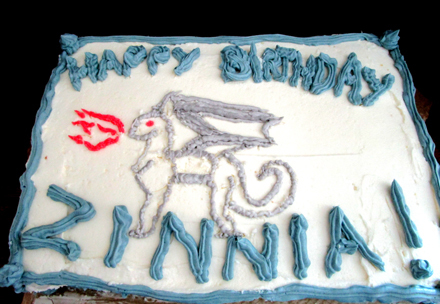 February 3 is Zinnia's birthday and here she is all grown up and 11 years old. Where is that little girl I used to carry around and show stuff to? James always makes the birthday cake and decorates it. The dragon is because Zinnia is in the Dungeons and Dragons phase, the same one son Hanley went through around 40 years ago..
February 12. 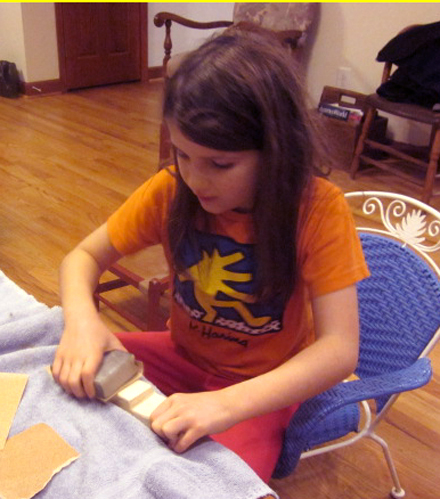 Granddaughter Elizabeth is in the Brownies and here she is working on her pine wood derby car. Grandaddy furnished a work place and some tools but, unlike some daddies and grandaddies, let her do the work... 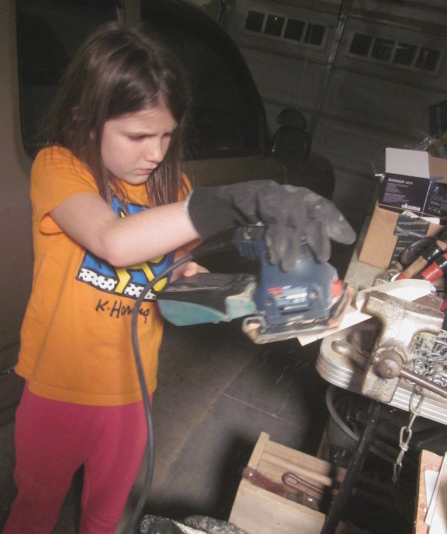 This electric sander looks like a pretty advanced tool for an 8 year old, but the photographer was right there watching and ready to step in if needed. February 13. Our house is nest door to the granddaughters and granddogs house and both can freely move between the two houses since we have a common fence around the back yards. 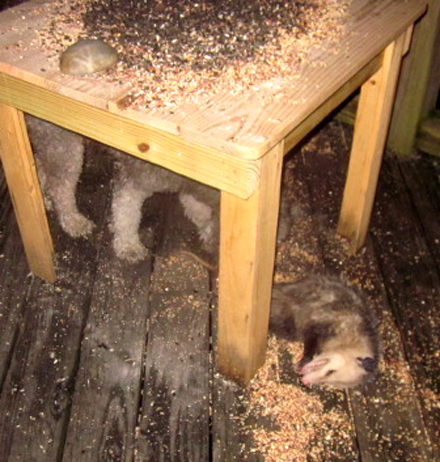 The dogs came over at around 6pm and suprised this possum who immediately conked out and pretended to sleep. March 8. Another light snow. 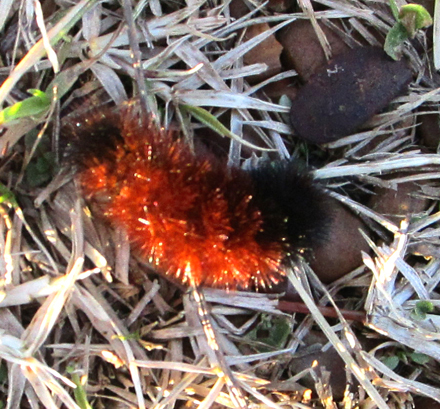 The last gasp of winter. March 19. 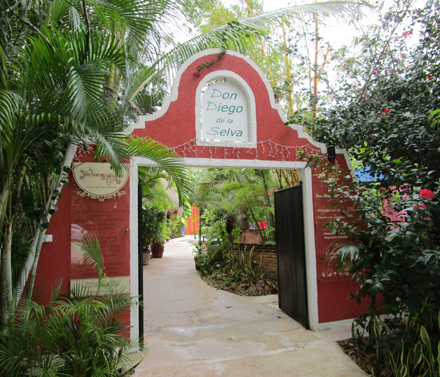 This is the entrance to Don Diego de la Silva, our hotel in Tulum, Mexico. Owned and run by two Frenchmen. Beautiful place and well run. We highly recommend it. 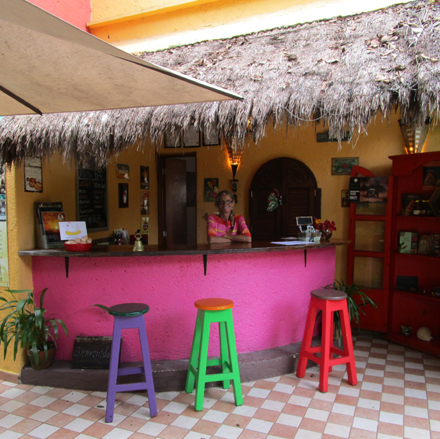 Here is the little bar and that's Maria behind it. She was a fine waitress, bartender, and general go-to person. They sell wine, beer and booze, but it's fine to buy your own elsewhere and have it with dinner. They have a really varied menu and their dinners and lunches are great and reasonably priced. Breakfast came with the room and was great. This pool is really beautiful. The grackles and doves love to come and wade around the shallow edge picking off moths and bugs that get caught in it. You can see a little of the roof of the open dining structure in the photo to the left. 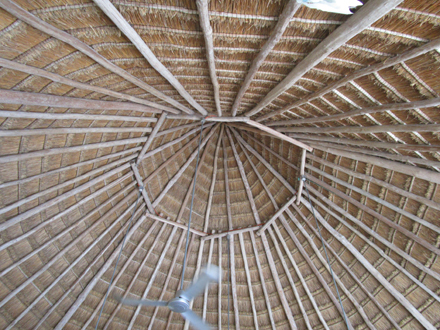 Here is the inside looking up. It must have been 40 feet high. 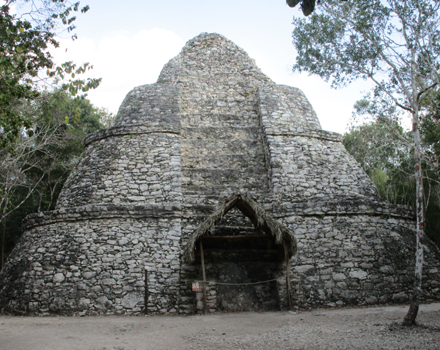 These Mayan decendents have wonderful building know how. Great food too. 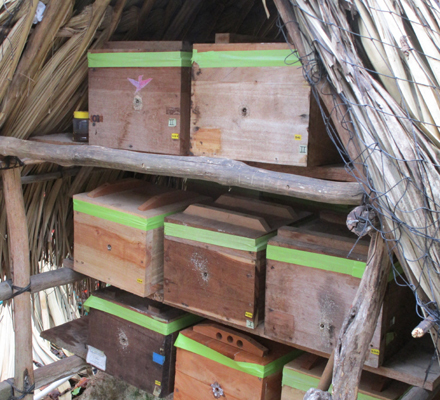 These are hives for the native stingless bees they raise on the site. We had their honey for breakfast. 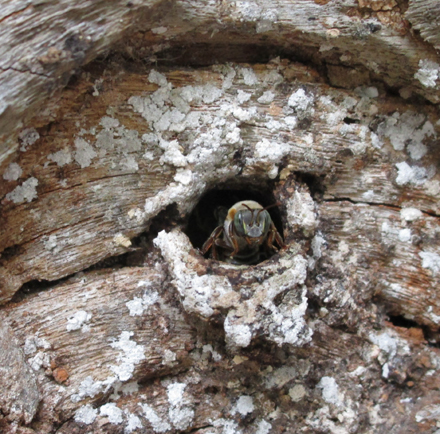 The owners are helping preserve these Mayan bees as they are declining in numbers elsewhere in the Mexico. The bees are tiny, about the size of a large fly. They were raised by the Maya long before the Spanish invasion. There is a very interesting exhibit here about the bees and their life cycle and busloads of school children visit to learn about them. 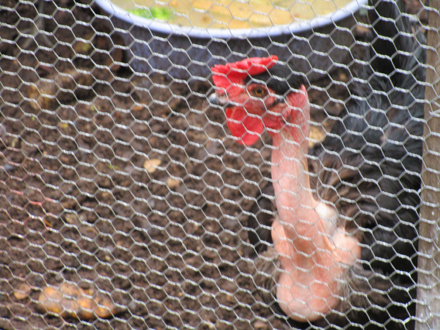 The naked neck chickens are pretty ugly, but their eggs are fresh and good and their drumbsticks are too. Whoa! If beauty is only skin deep, what about ugly? 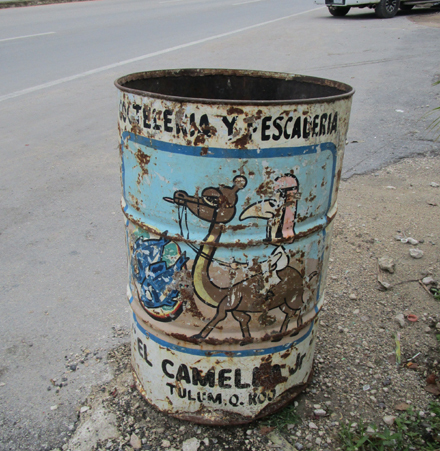 Mexico is full of artistic works, even the trash cans are gaily decorated. 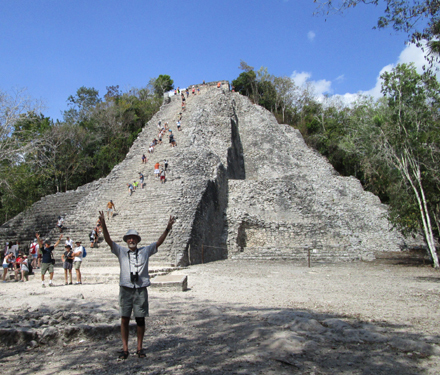 We visited Xel-Ha, a Mayan site not more than 30 miles from Tulum. This was an unusual large structure. I guessed it was a storage building. 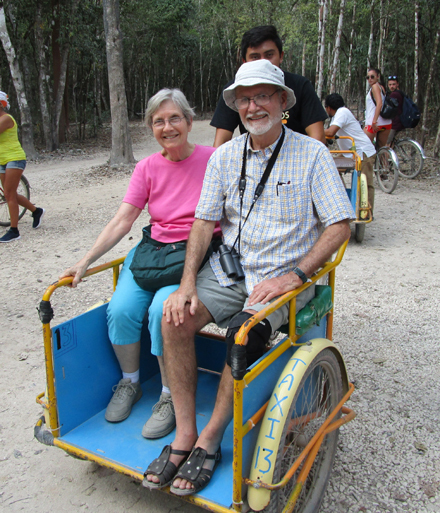 The site was quite extensive so we rented this bicycle guide powered cart to get around. 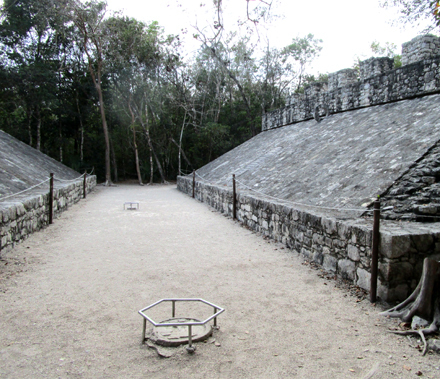 This ball court is extremely well preserved. You may not be able to make it out, but way up at the top and at the center is the stone hoop the ball had to go through for a score. 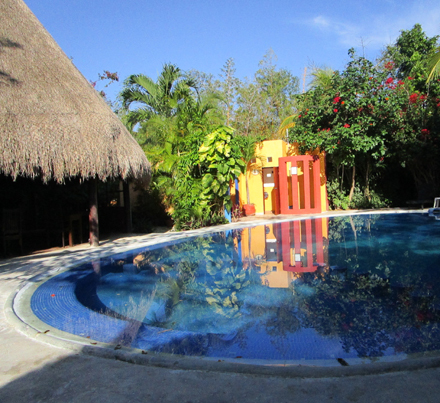 This is the largest of the Xel-Ha structures. See the ants going up and down? They almost look like tourists with very little sense but a lot of energy. We declined to climb. 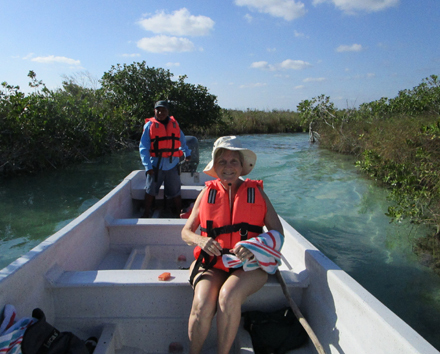 We took a canal tour at Sian Ka'an, a site not far from Tulum. There are a series of huge shallow lakes there connected by long canals dug by the Maya. What clever folks they were! There is a gradual drop between lakes, so there is a flow of current in the canals. The water eventually reaches the gulf. The lakes and canals have sand bottoms and our boat took us across a big lake to the top of a canal where we jumped into the water and floated down stream, Our boatman following after us. It was cool and great fun. At the entrance to the next lake we climbed back into the boat and sped back to the main dock. Highly recommended. May 11. Back home and here are two of the three more or less pet turkeys that visited our deck all last summer and fall. They disappeared in the late fall, around Thanksgiving, so we figured they were probably providing dinner for someone. 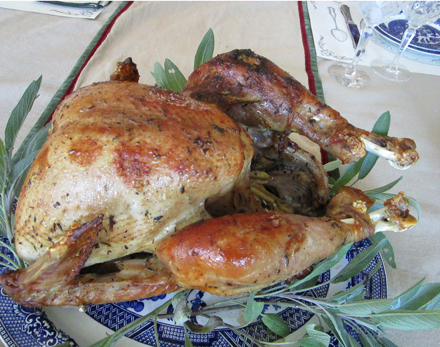 But not all got eaten-- at least these two didn't. One of the neighbors said he had seen the three of them fly across the river last fall, so we think they have been living over there. We only saw them this once so now we wonder where are they now?. May 16. Horse racing time at Churchill Downs. And guess what? I got lucky on the last race and won about $35, enough to cover my losses on the others. Great day, huh? May 20. 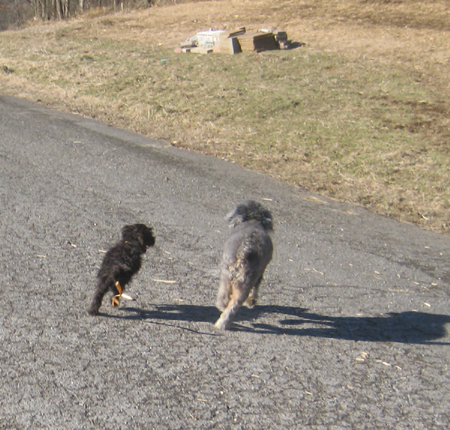 Took the dogs for a run down near the Stones River boat ramp where there is a hugh field mostly deserted. Any time there was a mud puddle you would find Raven (RayRay to her children) in it. 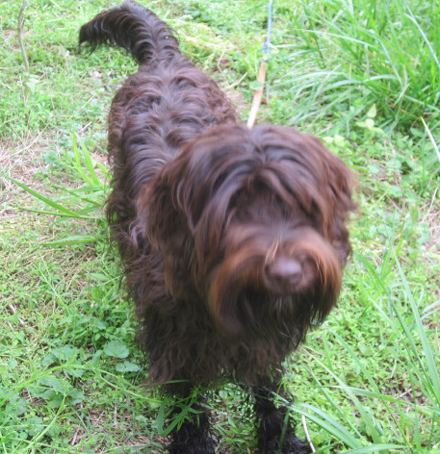 She's a labradoodle and the lab really comes out. She loves the water and she loves to retrieve. May 26. 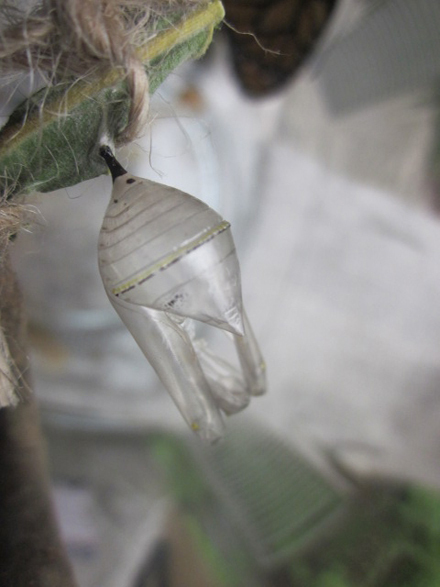 Sherry is worried about the monarch butterflies so we are growing milkweed and harvesting the catepillars and putting them into a butterfly cage. We keep them fed until... May 31. ...they make their crylissis and go to sleep for a week or two. 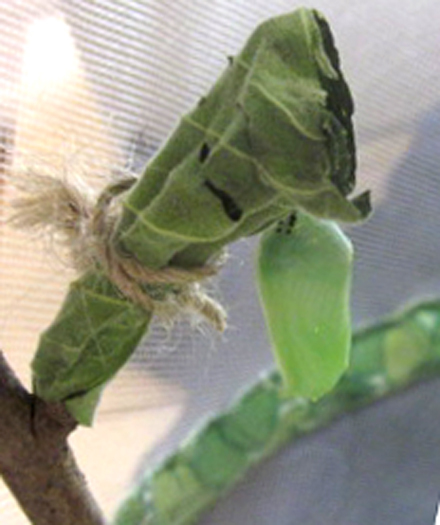 When the come out they are all wrinkled so they hang on to something handy until they blow up their wings and get their heads together. 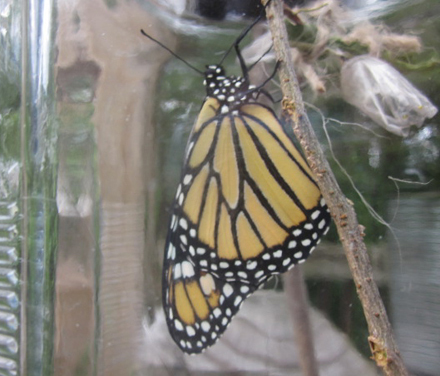 Here is a brand new monarch with wings all blown up and getting ready to climb out of the cage and fly away. I made a little video of that. It's on Vimeo. Click here to see it. June 24. 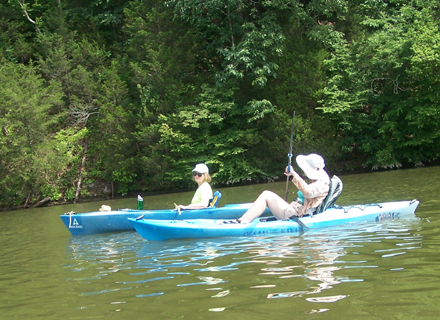 Sister Ann was visiting from Eastport, Maine, so we went for a kayak ride at Creek J. Here are Sherry and Ann on the way back to the ramp. And here is a friend who was crossing the creek as we came up. Just a garden variety little guy but pretty good swimmer. 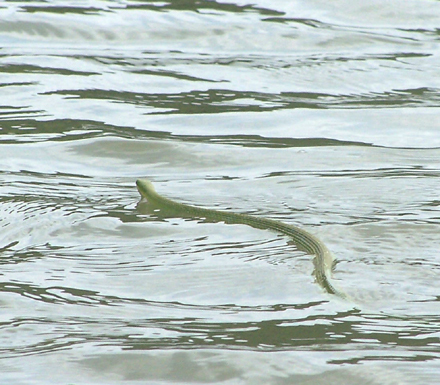 We seldom see snakes on the creek, but now and then. June 20. Mariana, a friend of son Hanley, came down to Nashville to get accredited for teaching Montessori classes. She is originally from Argentina but now lives with her husband in West Virginia. She was a delightful guest and we missed her when she went home. RayRay really missed her since she was tireless in throwing her ball for her to retrieve, her true passion. Mariana always made her put the ball on her lap. When she didn't she would say, Aqui!" Now when I want the ball put closer I say "Aqui." It works. July 17. 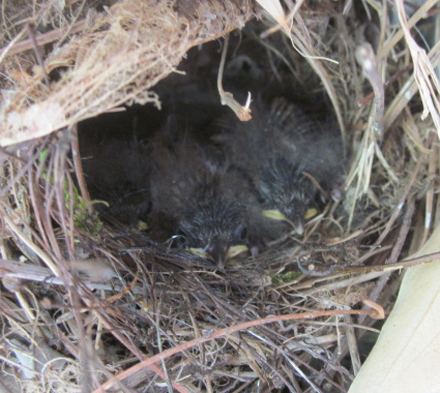 A really optomistic wren build a nest right over daughter Travis' front door. Here is a pic of the babies. We think they made it ok because not long after this they were gone and no bodies were found. 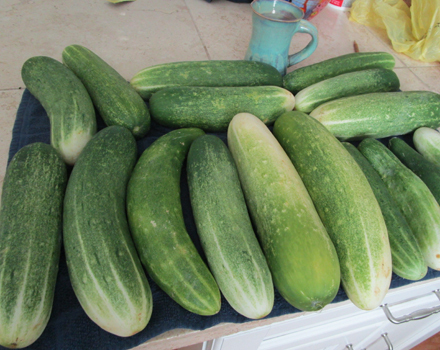 We had a bumper crop of cucumbers as I imagine almost everyone else did. Hard to give enough away so I've pickled so many Sherry is fussing about the room they take up in the frig. Tomatos did fair but not as well as expected. The big green peppers are mild as are the banana peppers. The jalapenos I gave away or pickled. Don't really want that much burn anymore. 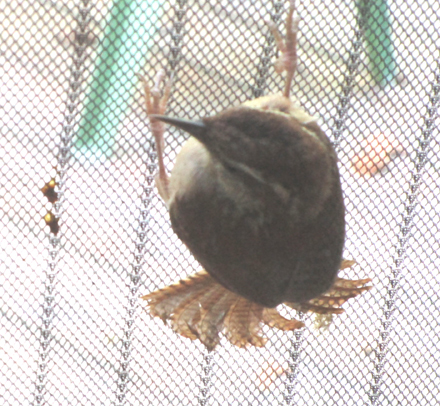 This wren got caught in our mesh door. It parts in the middle and closes with multiple pairs of magnets. Great for leaving the real door open so the dogs can let themselves in and out. In and Out... 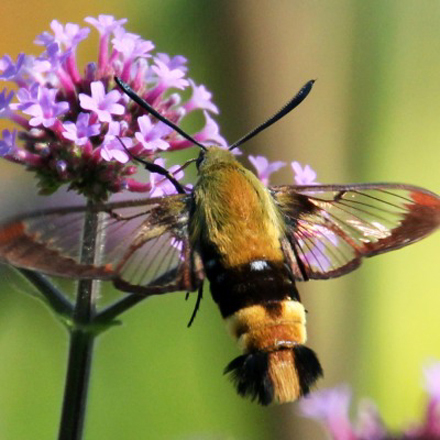 This hummingbird moth liked the flowers Sherry put beside the deck steps in back. Nice pic, huh? Well, it isn't my shot, although I made one that was almost as good. Couldn't find it. July 21. 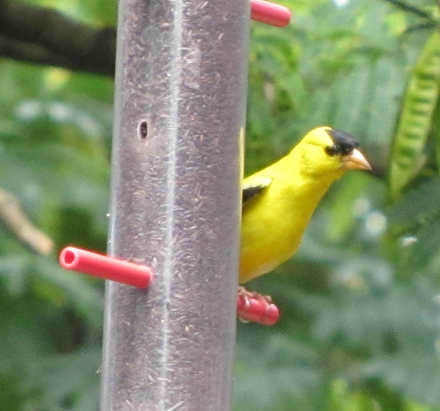 Beautiful goldfinch at our finch feeder. 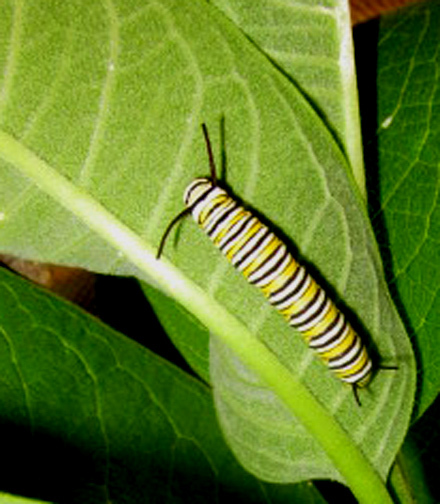 We don;t get many with so much natural food available elsewhere, but they sure are beautiful when they show up. 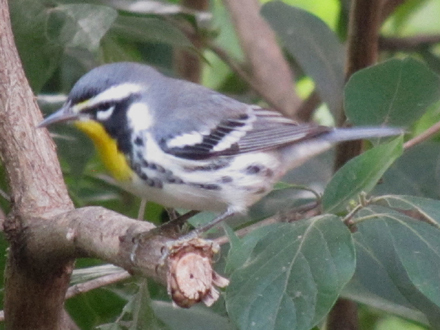 We finally identified this little bird as a yellow throated warbler. We seldom see them around here. Pretty, huh? This male indigo bunting isn't a rare bird, but they seldom come to the deck for our food offerings. July 20. 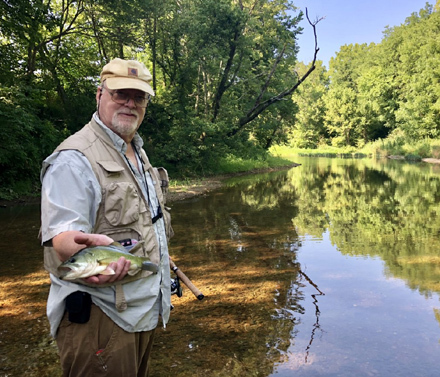 Here is Harry with a nice little bass on the South Harpeth, one of the best small mouth creeks around. Trouble is there are houses all along the creek and folks aren't always happy to see you wading down along their back yards. 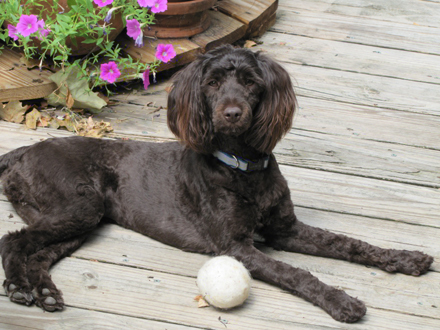 Fortunately, Harry's friend, Ryan, lives on the creek as do several of his relatives. They also know almost everyone for a mile or so up and down. This got us a way to fish it. 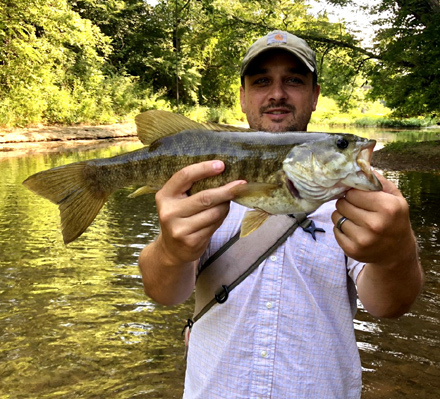 Naturally, home boy Ryan scored the best catch with this small mouth.. Here's another friend, Ben. 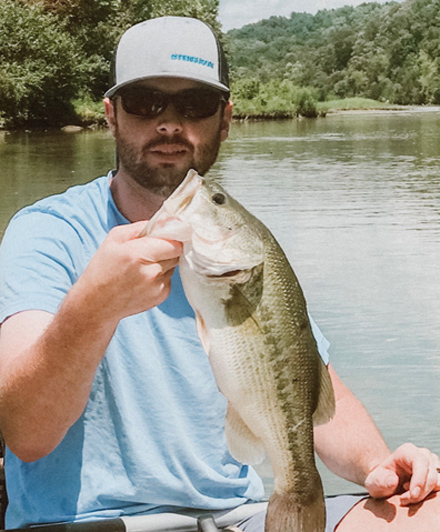 He caught this nice large mouth on Creek J.
July 23. 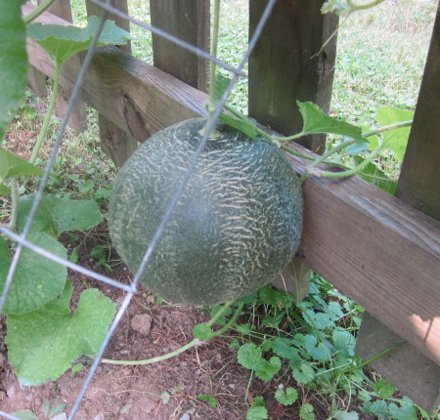 Once again I planted cantalopes and watermelons along our fence in our front yard. 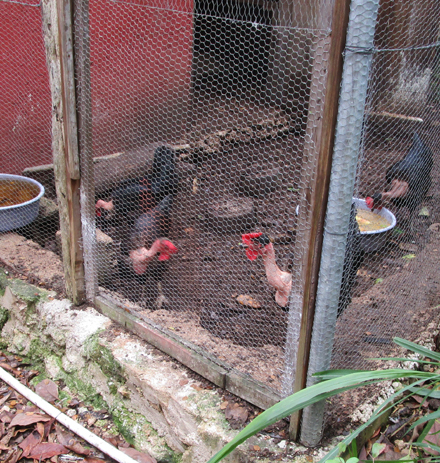 They did pretty well, but of the 5 or six that made it to maturity 3 or 4 got ruined by possums. 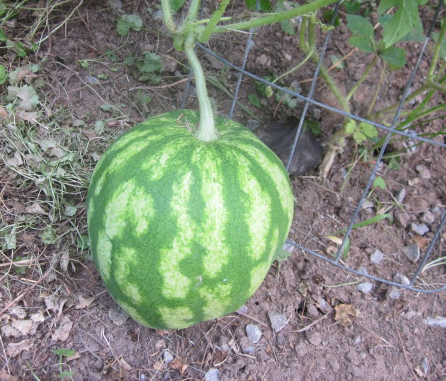 This is one of my pretty watermelons the possum got. Finally, I got riled and set out my Hav-A-Hart trap and caught him. He now lives way down by the Stones River ramp where I am sure he is just as happy as can be. September 22. 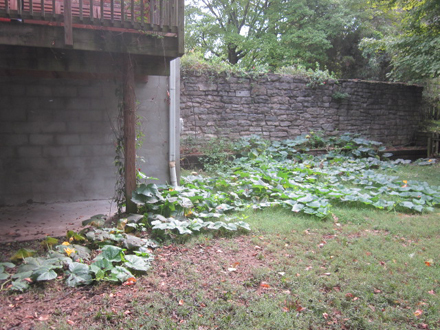 This is the run away acorn squash plant in daughter Travis' back yard It got even bigger before the first frost in November got it. 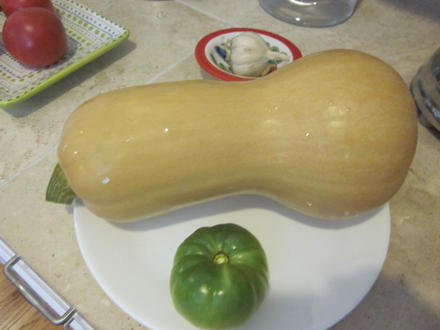 Here is one of the many squashes it produced. Next to it is my last tomato of the season. The tomato eventually got ripe and was almost as good as vine ripened. Well, not really, but better than store bought. September 23. Back there is my magnificent construction--almost as impressive as the great wall of China: My mile-high lima bean trellis. The dead beans here and there came from an idiot I hired to pull weeds. He had pulled half the limas before I caught him. Arrrrrggggg.... Earlier in the year just as the tomatoes were past their prime but still producing I came down one day and found them all gone. First thought was tomato thieves, then I looked again and saw the deer tracks. So, above you see my 8 foot deer fence. 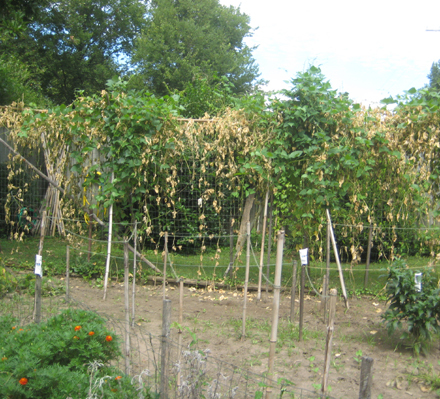 Another project almost as massive as the great lima bean trellis. You can buy this mesh on line . At the top is plastic covered cable. 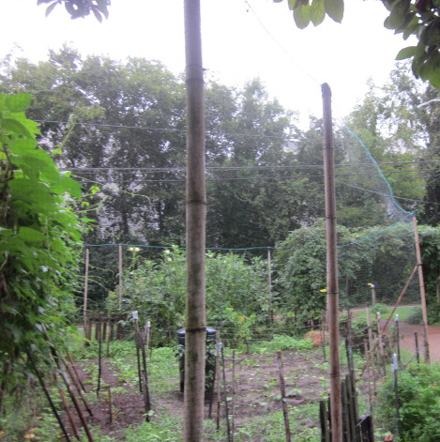 The mesh lets in the light and keeps out deer. Isn't it cute? I didn't take many veggie pics this year, but here is one of the veggies still going in late September. 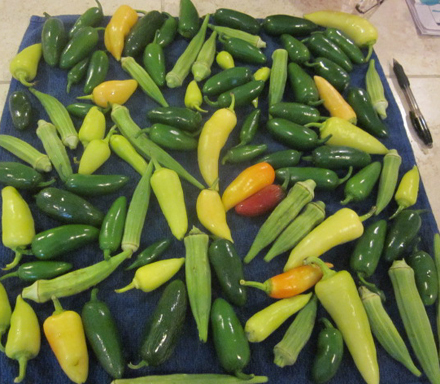 Banana peppers, jalapenos, and okra. They all kept on trucking until mid October. In mid-August I planted lettuce, turnips, kale, and chard. 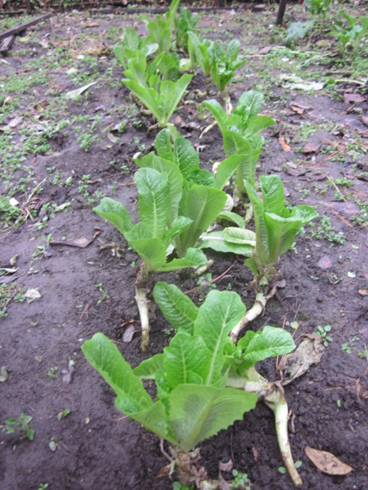 We are still getting romaine, but this week has been rough on it with below 30 degrees several mornings. The arugula and the others should be ok. October 2. I volunteered some time back to handle the dish clean up and so on since my sweetie cooks and does so much more so it was only fair to share the work. However, my on the job training has gaps, as in this time where I used regular dishwashing liquid in the washer because the special washer powder was empty. It only took a couple of hours to clean up. October 20. Both grandbabies are into sports. 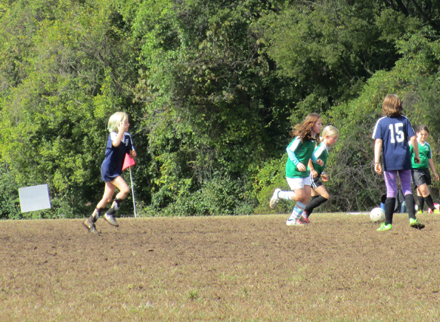 Above is 10 year old Elizabeth (birthday was the 17th) at the last soccer match of the season. 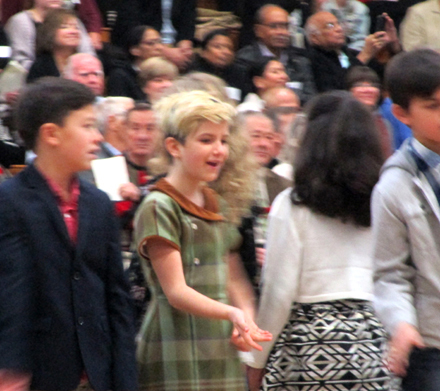 She's the one on the left with the bright blond (dyed) hair. There she is again smiling nicely for the group photo. The game ended in a no score tie. Hey, could have been a loss! This was my day to deliver and pick up the girls. 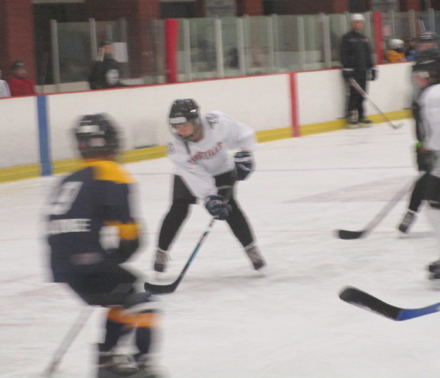 So after Elizabeth's soccer game we went to pick up Zinnia at the hockey rink. That's her in the white shirt. 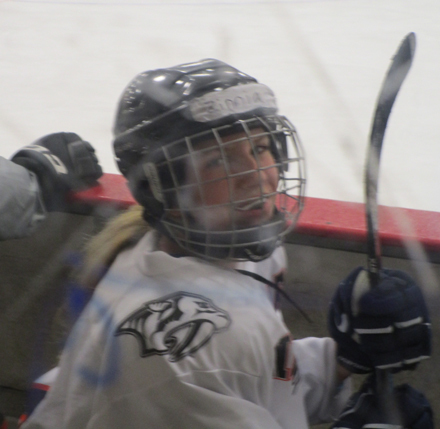 Here she is taking a break after a hard scrimmage. October 21. 10 years old! Elizabeth breaks into double didgits! The party is a few days late so it can be on the weekend (her birthday was the 17th), but it included another of James' great birthday cakes. 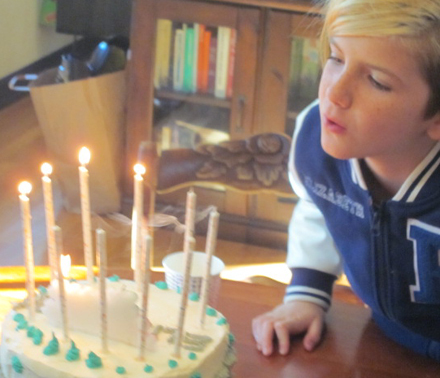 Blowing out 10 candles is not so easy, huh? 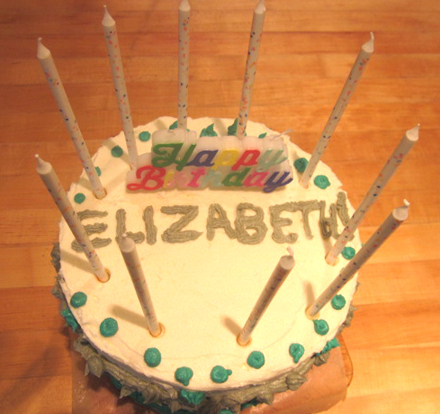 Wait until you have a cake with 77 candles. That takes some wind power, let me tell you. I know! 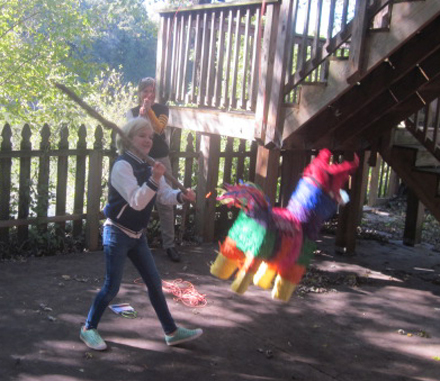 Here is the birthday girl getting the first swing at the pinata. Unlike the almost indestructable pinata of previous years, this one only made it through three whacks. 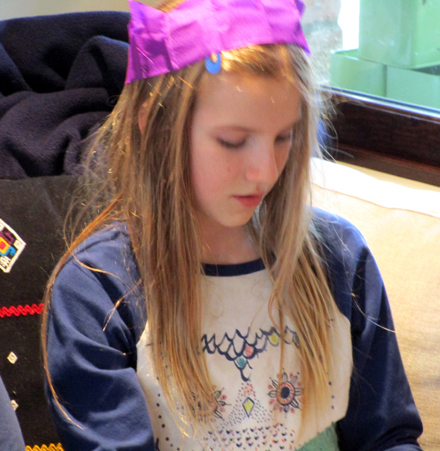 But it was loaded and all the kids got a sack of really nice stuff. October 31. Elizabeth visited us on halloween and scored anothe nice sack of stuff. 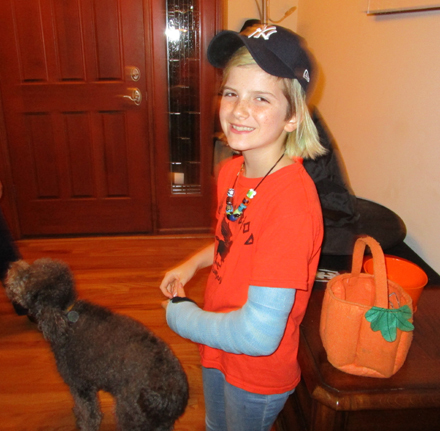 Here she is showing the cast on her left arm. It was broken as she jumped out of the bouncy house at the end of her birthday party, slipped. and crashed. It'll be off in another three or four weeks. November 20. 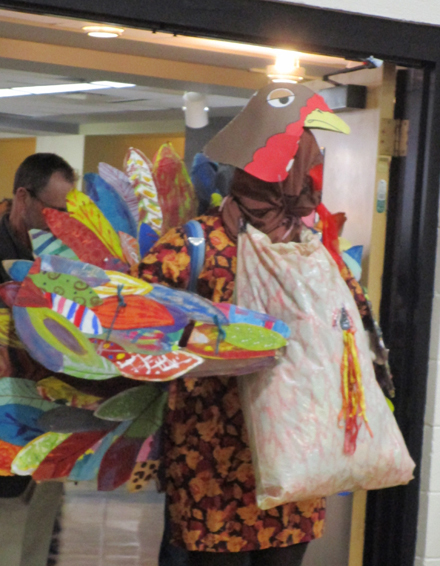 Here is the mystery faculty member of the girl's school dressed up in the traditional Turkey Trot costume. He did a fine strut and wobble and gobble to the applause of kids and grandparents. 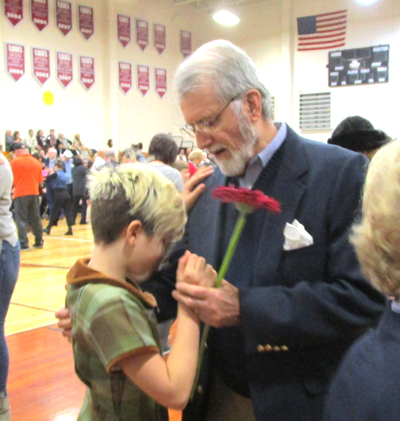 I guess I should explain, the occasion is Grandparents Day at University School of Nashville. 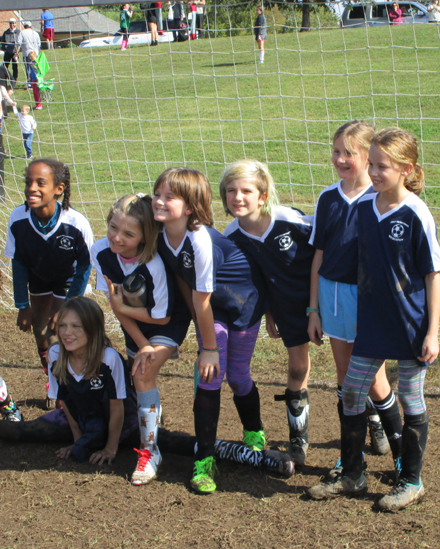 We have attended every season since Zinnia started but since Elizabeth is in the 4th grade this was our last go. One of the fest features of this do is that the 4th graders give a flower to their GP's and waltz with them. At least they try to teach the old folks how. Elizabeth was a good teacher and I actually relearned the step I forgot so long ago. Sherry danced with her too and they did fine. 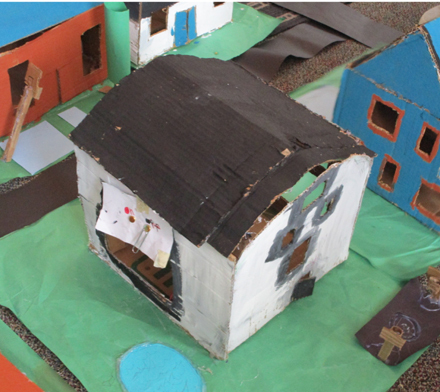 After the big event in the auditorium we visited Elizabeth's classroom where the various projectw were on display. Pretty need little house, I thought. November 22. 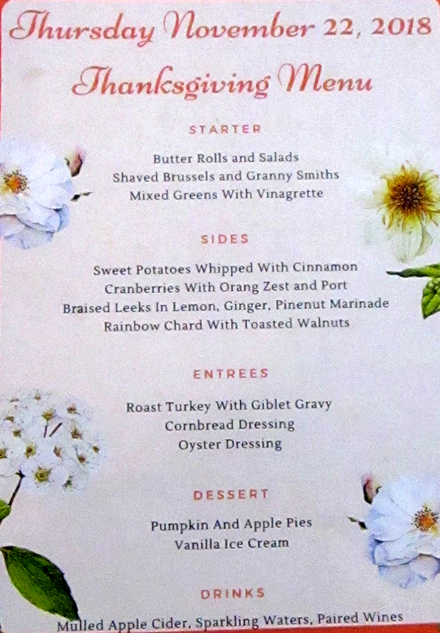 We get invited next door for Thanksgiving dinner and even got a beautiful menu to tease us with what was to come. 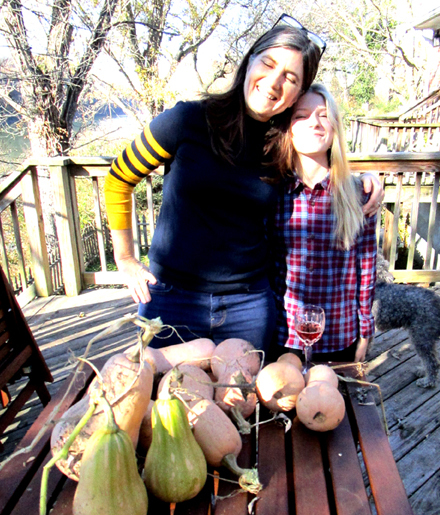 While waiting for James to put the goodies on the table Travis and Zinnia show me the final collection of giant acorn squashes from the giant Eggplant (squash) Plant That Ate Chicago. It's an old novelty song. Check Youtube. 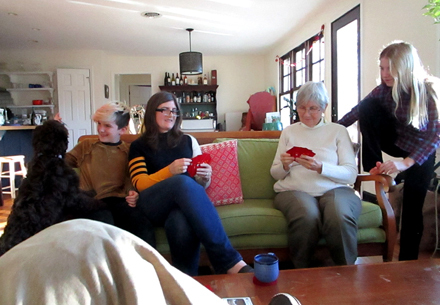 While we waited and waited the ladies played various card games while I mostly relaxed with a beverage and threw balls to Ra Ra. Fit for the Gods, but destined to be eaten by mortals--us. Not only did James and Travis provide great side dishes, Sherry brought her famous dressing, scratch cranberry sauce, and oyster dressing. Yum and double yum. 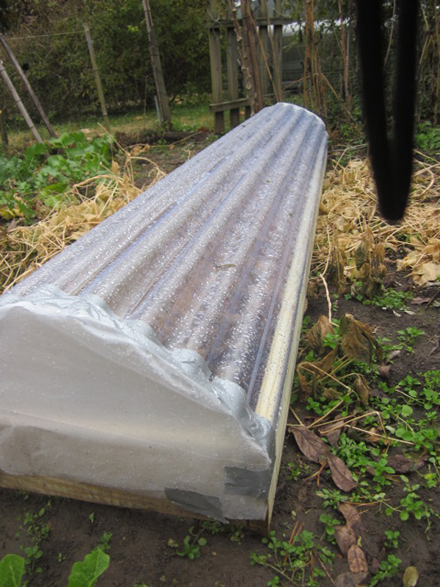 ...constructed this cold frame using a sheet of clear corrugated roofing and some 8 foot deck boards. 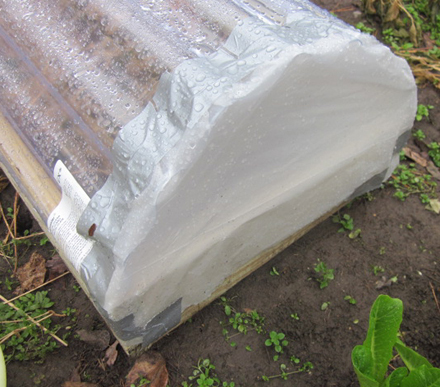 Plugged up the ends with clear plastic and ended up with my very first cold frame. And here we have it. One thing I learned on the internet is that you have to take it off now and then to water the lettuce. 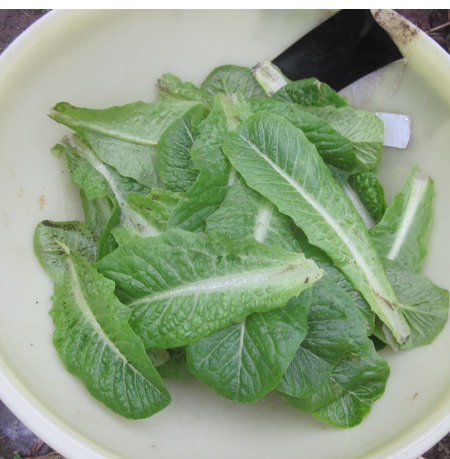 So, with good luck we may have fresh lettuce all winter and into next spring. We will see. December 18. There is a gap of a month when I didn't take any photos. These were taken through the window on a cold day when we got a dusting of snow. The dogs are trying to drink out of the ice in the bird bath. 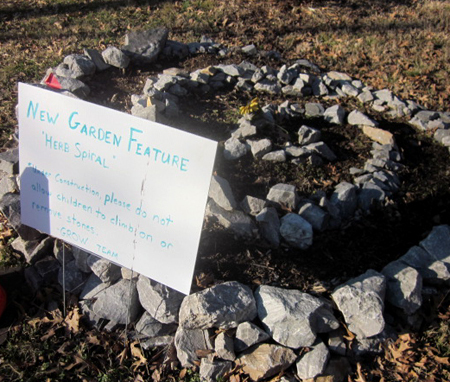 This is the bird bath Sister Ann gave us many Christmases ago. You can see the sleety snow the dogs were checking out in the previous photo. The cold weather brought out some birds we don't see much when it is warmer and there are plenty of bugs, worms, and larva for them to get. Here is a very pretty female red bellied woodpecker. The squirrels are also active now. I don't mind them much as long as they don't get on the hanging feeders. When they do I say "SQUIRREL" in a hissing way and the dogs go crazy until I let them out to chase them off. December 24. 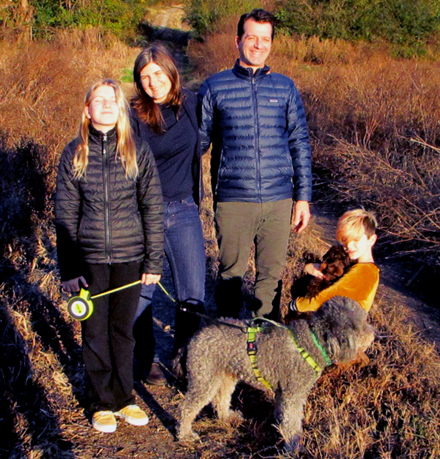 It wasn't much of a snow but Travis and Elizabeth got out in it with the dogs in their little needed cold weather coats. At last all that thick hair comes on handy for Puppy and Rayray. Later on Elizabeth dressed the dogs in their Christmas outfits. Right in season. The night before Christmas and all the presents are present below the little wooden tree I made so long ago I can't remember when. Each year I put it together and the girls and Sherry hang all the orniments we've accumulated over the 54 years we have been married. Well, that's all for 2018. It won't be long before all the presents will be given out and all the wrapping will go into the recycle and all the lights and orniments will have to be packed up and the little wooden tree taken apart and wrapped up to wait in the attic for it's star role next year. May all of us and all of you be present and healthy for the 2019 Christmas. .